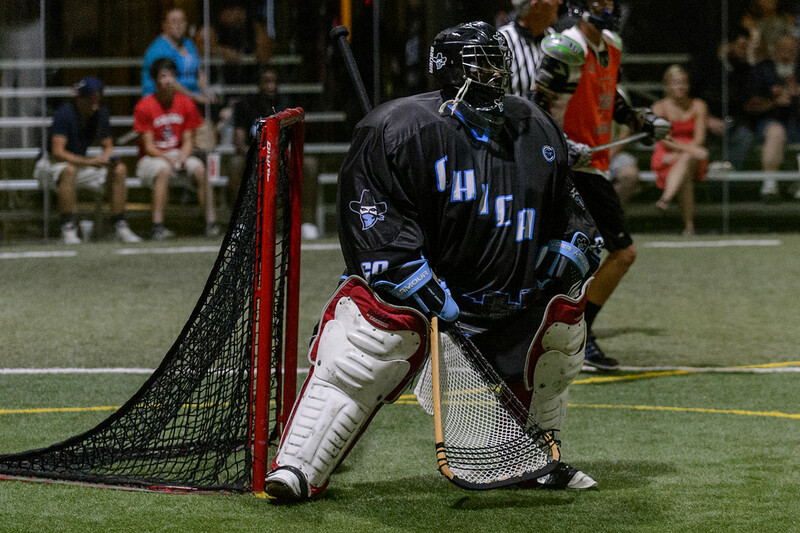 Desmond Bailey is the goalie for the CILL defending champion Chicago Outlaws. I sat down with Desmond to find out more about him, his team, and Box lacrosse in the Midwest. 1. Have you always lived in Chicago? Yes sir, born and raised on the north side of the Chi. 2. When did you start playing lacrosse? I started playing lacrosse sophomore year of high school after quitting baseball and I have been in love with the sport of lacrosse ever since. 3. What got you into playing Box? A friend told me to show up to open pick up box lacrosse, and I am so glad I did because I got hooked immediately. Sometimes I wonder how things would be if I didn’t go that day, but we’ll never know. 4. Who has played a big part in your lacrosse career? Ray Kincaid has played a HUGE part in my lacrosse career. He has always looked out for me since day one, from helping and finding the resources to make me a better goalie and human being. That dude completely loves the game and wants to spread that love to everyone he interacts with. 5. How did it feel to win a CILL title last year and bring another sports title back in Chicago? It felt totally awesome! Winning a championship in your hometown is one of those things you have so many words for. We wore our Chicago flag jerseys that night, and that game against that grand rapids team led by Cam Holding was prime example of what the city of Chicago’s hard work and spirit is all about. Glad the Outlaws could add to another sports title here. 6. What do you guys need to repeat as champs this year? Staying focused and be better than the team we were last year. Winning a title you have a huge target on your back, and every team in the league is gonna give it their all to knock us off the mountain top. 7. With new teams entering the CILL this year what’s your thoughts on the growth of Box lacrosse in the Midwest? It’s pretty cool seeing box grow in the Midwest. Back in 2005 you never saw box programs for our youth; it’s almost everywhere now. Some places in the Midwest they teach the box and field game all in one sitting. As for the adult level a lot of guys straight out of college are finding out about box for the first time and they are picking up the game very quickly, and it makes for some very competitive lacrosse in the CILL. Just look out for a Midwest revolution coming. 9. Besides lacrosse what are some other things you are into? I’m very into music. I am a touring hip-hop artist—I spend most of my time writing and recording if I’m not blocking shots. I’m also a huge hockey fan and hockey sweater collector with a huge collection.